1. Scaling concepts in phase transitions and polymer theory (for chemists, USU), 16 hours. Basically this was a course on P.-G. De Gennes, Scaling concept in the physics of polymers, with some general introduction to the renormalization group ideology. 2. Path integrals and their applications to quantum mechanics (for mathematicians, USU), 32 hours. 3. Crystal lattice dynamics (Institute of Metal Physics), 20 hours. This was a course to prepare postgraduate students to PhD exams; basing on this course, a textbook has been published later (M. I. Katsnelson and A. V. Trefilov, Crystal Lattice Dynamics and Thermodynamics, Moscow, 2002). Moessbauer effect and neutron scattering has been considered in detail. 4. Introduction to philosophy of science (Department of Philosophy, Ural Branch of Russian Academy of Sciences), 12 hours. This was a course to prepare postgraduate students in physics to PhD exams in philosophy (according to Russian traditional requirements). It was concentrated on the criteria of verity in scientific research, comparison of the methods of theoretical, experimental, and computational physics, etc., with very brief overview of the history of physics. 5. Theory of magnetism (Uppsala University), 20 hours. The key points were spin-wave theory of ferro- and antiferromagnets, scaling theory of critical phenomena, itinerant-electron magnetism, and brief overview of modern topics (Kondo effect, heavy fermions, spintronics). 6. Many-body theory (Uppsala University), 32 hours. Introduction to the quantum many-body theory (in spirit of textbook by G. Mahan): basic rules of Feynman diagrams, applications to homogeneous electron gas, plasmons, excitons, fundamentals of superconductivity. 1. Mechanics and the theory of relativity (USU), 50 hours. Basing of this course, two textbooks has been published by Ural State University (see below). A key points were a broad using of the phase space when considering oscillations, brief introduction to the general relativity (equivalence principle, etc. ), detailed consideration of the Kepler problem. 2. Molecular physics (USU), 50 hours. This course was more or less in spirit of Feynman Lectures in Physics. 3. Classical electrodynamics (USU), 50 hours. This course was basically in spirit of Jackson's Classical electrodynamics, but with more stress on solid state physics (normal and anomalous skin effect, plasma phenomena in metals an semiconductors, phenomenological theory of ferromagnetism). 4. Quantum mechanics (USU), 50 hours. Apart from traditional problems, coherent states and path integral formalism were considered, as well as von Neumann's measurement theory and some problems of interpretation of quantum mechanics. 5. Quantum theory of solids (USU), 7 times, 50 hours each. Basing on this course a textbook has been published (S. V. Vonsovsky and M. I. Katsnelson, Quantum Solid State Theory, Springer, 1989). There were two versions of this course, for experimentalists (4 times) and for theoreticians (3 times). 6. General physics (for mathematicians, USU), 2 times, 50 hours each. It included basic principles of classical mechanics, optics, relativity theory, and statistical thermodynamics, of course, in very brief presentation because of the lack of time. 7. Introduction to natural sciences (for humanitarians, Liberal Art University, Ekaterinburg), 3 times, 20 hours each. The presentation was in spirit of Feynman's Character of physical laws, with addition of basic history of science and brief overview of some contemporary approaches (I. Prigogine, etc.). 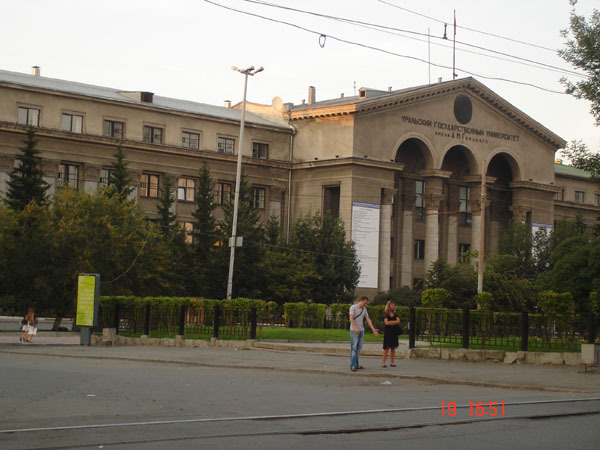 Physics (The Specialized Educational and Scientific Center of USU - Lyceum), 5 times, 100 hours each. There were two-year and three-year advanced physics courses for high school, from mechanics to the atomic and nuclear physics. 1. V. G. Koreshkov, Three-body interatomic interactions in alkali metals (1990). 2. G. V. Peschanskikh, The effect of electronic topological transitions on lattice properties of metals and alloys (1992). 3. I. A. Kaibichev, Surface elastic and magnetoelastic waves in crystals (1994). 4. A. A. Katanin, Self-consistent spin wave theory of low-dimensional and frustrated magnets (1996). 5. A. K. Zhuravlev, Electronic phase transitions in 1D spinless fermion model with competing interactions (1999). 6. D. W. Boukhvalov, Electronic structure of molecular magnets in LDA+U approach (2004). 7. A. Grechnev, Theoretical studies of two-dimensional magnetism and chemical bonding (2005). 8. O. Wessely, Theory of X-ray absorption spectra and spin transfer torque (2006). 9. O. V. Manyuhina, Frustration in soft matter: Interplay between order and curvature (2009). 10. I. Di Marco, Correlation effects in the electronic structure of transition metals and their compounds (2009). 11. K. V. Zakharchenko, Temperature effects on graphene: from flat crystal to 3D liquid (2011). 12. J. Mentink, Magnetism on the time scale of the exchange interaction (2012). 13. M. A. Akhukov, Structure and magnetism of defected carbon materials (2013). 14. D. Yudin, Trends in magnetism: From strong correlations to -onics technology (2015). 15. L. Peters, Theory of electronic structure and magnetism of rare-earth and transition-metal clusters (2015). 16. F. Buijnsters, Linear and nonlinear excitations in magnetic films (2017). 17. I. L. M. Locht, Theoretical methods for the electronic structure and magnetism of strongly correlated materials (2017). 18. R. Logemann, Geometry, magnetism and electronic structure of transition-metal oxide and carbide clusters (2017). 19. E. G. C. P. van Loon, Collective phenomena in strongly correlated systems (2018). 20. H. C. Donker, Quantum decoherence and measurement in small spin systems (2018). Development of educational programs for a new speciality Mathematical simulation of physical processes, Dept. of Mathematics, Ural State University, 1992-1996. Traditionally the physical education of mathematicians were too superficial, at least, in Ural State University, and research and education in mathematical physics were concentrated on classical problems (partial differential equations, etc.). It was an attempt to develop more contemporary approach with the stress on quantum physics and, correspondingly, on contemporary algebraic and geometrical methods. I participated in this work as a Professor of Mathematical Physics, together with mathematicians from Ural State University and Institute of Mathematics and Mechanics (N. N. Krasovsky, A. M. Ilyin, V. V. Mansurov, and others). Publications in the nature of popular science, philosophy of science, etc.